You really ought to try the Gaffelbiter from Ingebretson's. Cheap enough. It really should only be taken on rye crackers washed down with Akvavit though. 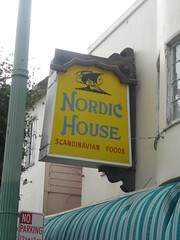 I headed on down to Nordic House. There I got some Lykkeberg Gaffelbidder i dild, Gaffelbidder i tomat, and Gaffelbidder mit Sherry Aufgub. Danish. I also grabbed some Bisca Rugkiks (39% Rug)(Danish Rye Biscuits (crackers)). 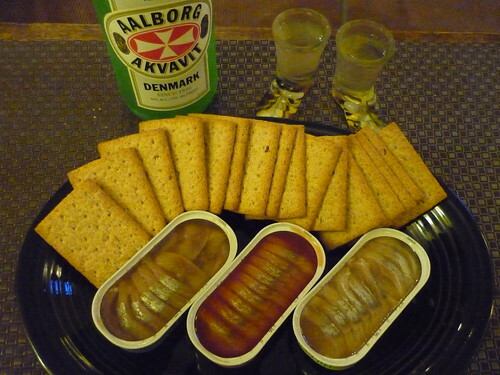 Then it was off to Bevmo for some Aalborg Akvavit. A Dane Night was soon to be had. I'd like to take a moment, now, to tell you about how that Staring Into The Eyes When You Toast seems be rooted in the Scandinavian World. No, really, there is tradition. Here, read about it here. The Akvavit is like a light rye flavored vodka. Caraway. Actually quite tasty. The bottle has been in the freezer since I bought it. 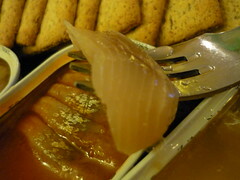 Salty little fish bites, like Danish Pickled Sushi. Firm texture. The Dill are pretty good. The Tomato are OK. The Sherry I could do without. The Rye crackers are quite good, even two months expired. Should have got a bit of sour cream and caviar to round out the plate. 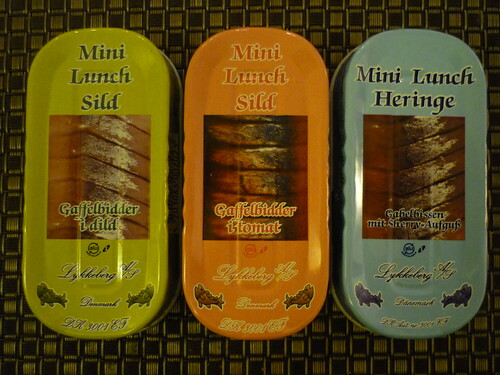 These aren't sardines, but they are interesting. We started with these, moved on to other edibles and then finished with some Anthon Berg desserty things. Your link to Ingebertson's is broken. And next time you stock up on Akavit, there is another pricier Aalborg, a touch more alcohol, but a supposedly smoother finish. There are also Andersons, Skane and another who's name I forget, but they are Swedish or Norweigan, so not worth your time or money. You make me want to go get a tin right now. This website may be the best thing to happen to the sardine community (under-served and misunderstood in my book). Aqvavit I'm sure would compliment them well, I'll have to try that!